20190420 EventHCS2019 1st Edition Poster!! 20190406 Trip ReportMOONEYES Staff Yano’s Thailand Trip Report! Bussiness hours for MQQN Cafe is changing. In addition, Business hour after May 7th(Tue) will also be changed. Every Monday from 2019 May 6th(Mon) is Closed. ※If Monday is a National Holiday it will be OPEN and, Tuesday will be Closed. We look forward seeing you at MQQN Cafe. ＊MOONEYES Area-1 is working as usual. Order from phone call is closed. Although, we will take order regularly from the Official Online Shop and emails. We will support your Car Life and Southern California Style! And many other item including RAT FINK and other character items. We also prepare many items for Pinstriper. MOONEYE is Southern California Style Company that spreads to the World. Everyday 5 times bonus point at MOONEYES Official Online Shop. All items deal with MOONEYES is covered. There are Premium item only sold in the Official Online Shop. MOONEYES USA will have MOONEYES OPEN HOUSE, again this year! If you visit California around this period, please come a visit. There are also Live Music, DJ, MOONEYES USA in-store special sales and much more! YOKOHAMA HOT ROD CUSTOM SHOW, organized by MOONEYES, is the largest indoor custom car and motorcycle show in Japan. It's also one of the most popular events worldwide with visitors from all over the world. The event features guest and builders from all over the world., swap meet and vendor spaces, live bands, custom paint contest, pinstripers and so much more wrapped up in a one-day show. ※Ride-in with two-wheeled vehicle is prohibited around the venue(Pacfico Yokohama) nd Minato Miral Area.Please use the public transpots to visit the venue. Thank you for your support and cooperation. Held total of 4 times in a year! Information for the events can be check from each Official Website. first Sunday is Sidewalk Sale! At the Sidewalk Sale in front of MOONEYES Area-1. Wildman's Pinstripe demo is also carry out. We also participate to several Events at other region. Event schedules are daily update. MOONEYES Mail Magazine (MMM), released on every Saturday 12pm.It will deliver special sale, event, MOONEYES Area-1 and MQQN Cafe's latest news!Extra news is also released irregularly! Sign up is easy and free! Feel free to sign up. It is an import agent service that MOONEYES will backorder the parts, wear, and other items in USA for you. (Depending on the size and weight, but most of the things arrives by air shipping) Request for estimate is Free! Feel free to contact us. A person who has enthusiastic to make MOONEYES bigger together, please contribute to us. Let's liven up Japan's California Car Life together! New International Magazine has Completed!! Beginning with Shige Suganuma's article of giving a spotlight to MOON Equipped Shop Ebisu Tokyo, MOON Cafe Mexican Food Nationals by IGNITE MAGAZINE Mr. Ishibashi, the popular Wildman's Talk and more other contents! We will be delivering many exciting contents. Heated atmosphere of the event is all covered! HCS2018 DVD Pre-Order it Now! 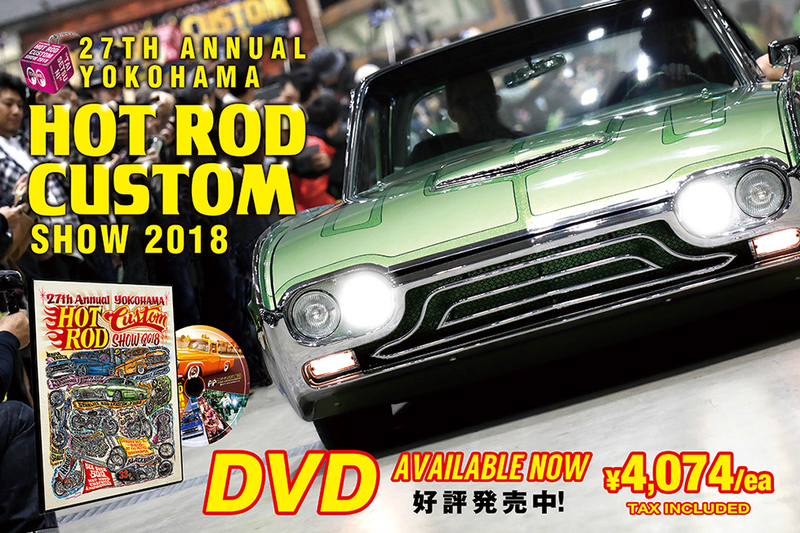 Sunday, December 2nd 2018 at Pacifico Yokohama 27th Annual Yokohama Hot Rod Custom Show 2018 (HCS2018) was held. The DVD fully covered the exciting scenes at the event like the advance interviews to guest at California, Ride in Show, and the first Pinup Girl Contest and more! Because we are Official, there are many scenes that we can take! but we also offer business trip Paint at MOONEYES Signs & Pinstriping Studio. From pinstripe on car to sign board for Shop, he will On Trip everywhere in Japan. and other things that paint can go on. Tools for pinstripe are sold in MOONEYES ONLINE Shop. contact MOONEYES Signs & Pinstriping Studio. Your question will be answered by Pro Pinstriper Wildman Ishii. MOONEYES AUTHORIZED DEALER is in every place in the world. You can buy MOONEYES items at shop near your house.